This comfortable, two bedroom apartment in Barcelona, located in the Sagrada Familia neighborhood is in a fantastic location, perfect for discovering the best of Barcelona. The décor in the apartment is cozy, colorful and perfect for a weekend getaway.Sleeping up to four people, this lovely apartment has two bedrooms and one bathroom. The apartment is equipped with Internet and air-conditioning for your comfort and the living room has a TV. It also has a comfortable couch, perfect for relaxing after a long day of sightseeing. The kitchen is fully equipped with all the necessary utensils and equipment, making it easy to enjoy home-cooked meals in the comfort of your own apartment. 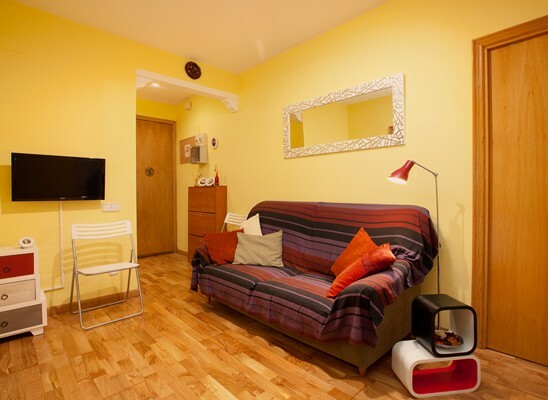 The apartment is in a great location and perfect for couples or a small family visiting Barcelona. Please note: Check-ins and check-outs on public holidays such as December 25, 26, 31 and January 1 will incur an extra charge of 30 Euros.